Molded plastic SAE flange mounts conveniently into any tankbag or saddlebag (soft or hard sided luggage). Easy to install, this bulkhead connector permits power to be passed through the luggage wall. Patented. Ideal for powering cell phones, GPS units, radar detectors, satellite radios, air compressors and other electrical gadgets. The connector can be installed into tankbags, top cases (tourpacks) or saddlebags. Power can come from an SAE battery lead, a Powerlet® outlet or from a battery charger SAE lead. Patented. 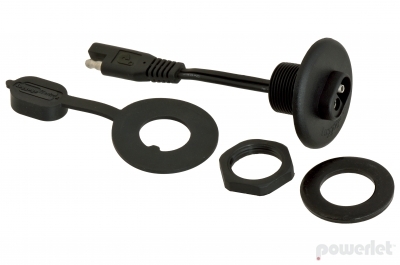 Built with touring riders and commuters in mind, Powerlet simplifies what to do with excess cords around the handlebars. For example, the excess GPS power cord can stay inside your tankbag while the GPS is mounted to your handlebars. Inside the luggage there is a Powerlet cable to fit your needs. The Luggage Electrix™ system is designed to help quickly hide expensive electronics when we step away from our bikes. Since the GPS or Radar Detector is plugged in inside the luggage there is no need to unplug it every time you stop for gas, food or to stretch. Remove the electronics from its mount and place it inside the luggage, there is no need to unplug the gadget every time you stop.